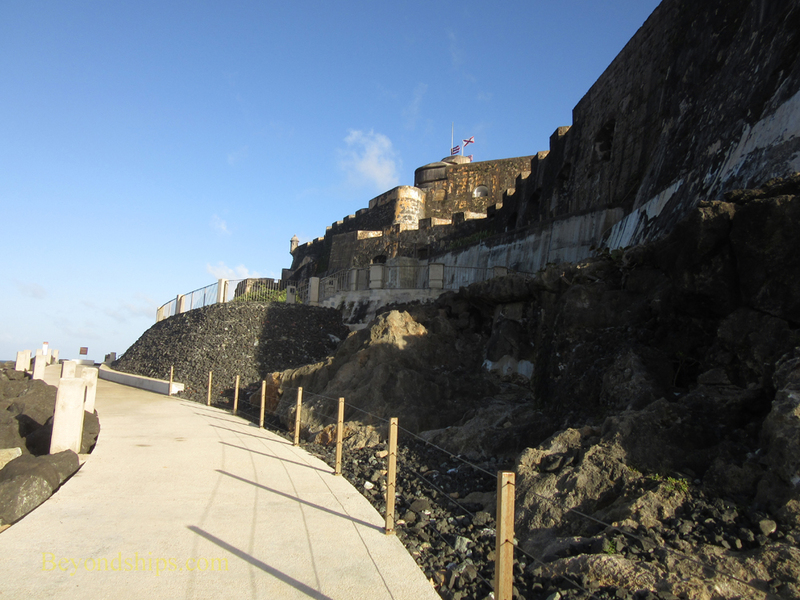 Continuing on past the Puerto de San Juan, the boardwalk becomes Paseo del Morro (walkway of the headland). The merger of the two promenades is almost seamless as they look very much the same. Only a metal gate marks the transition. 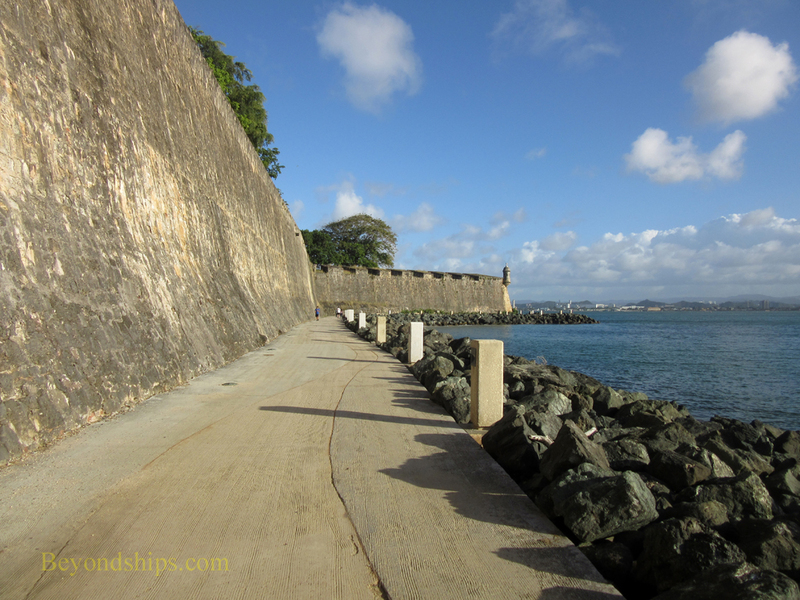 Paseo del Morro was originally a dirt track used for maintenance of the city walls and the headland upon which the El Morro fortress sits. In 1999, it was opened as a seaside promenade. 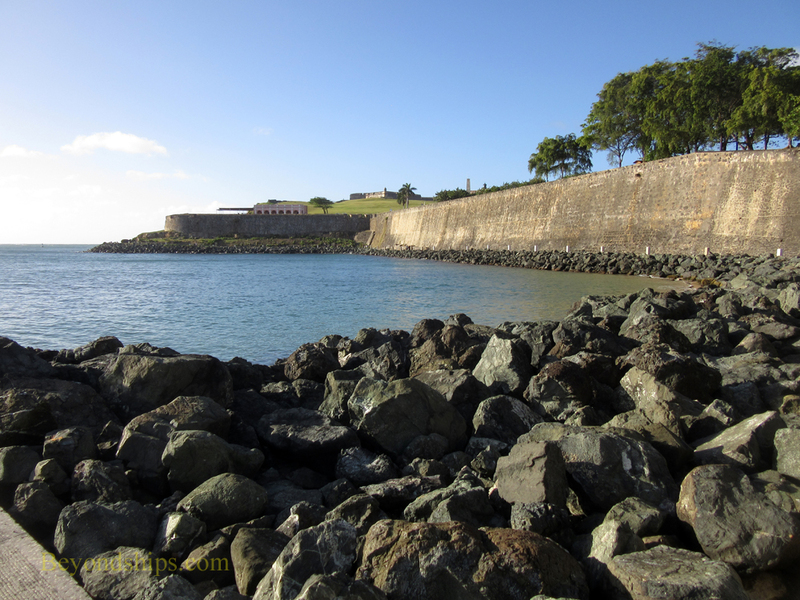 It is park of the San Juan National Historic Site and is maintained by the U.S. National Park Service. According to the Park Service sign, the path is one mile long from beginning to end. 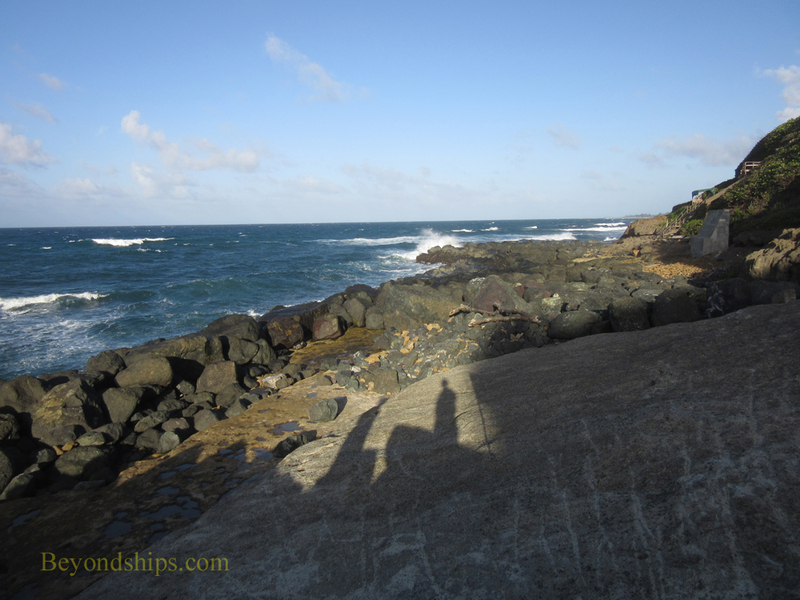 At this time, it runs from the Puerto de San Juan to El Morro. However, there is no exit from the paseo so you have to retrace your steps and leave the way you came. 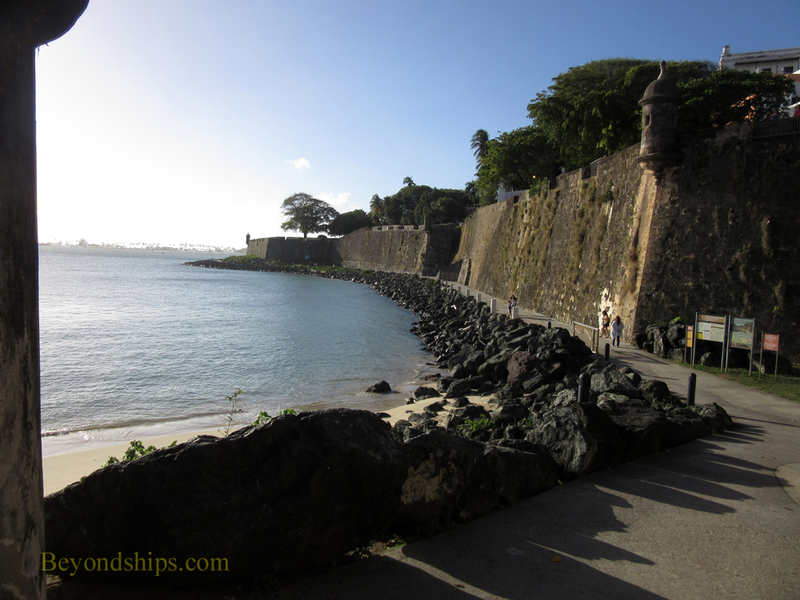 Like the end of Paseo de la Princessa, Paseo del Morro runs along the San Juan City walls at first. 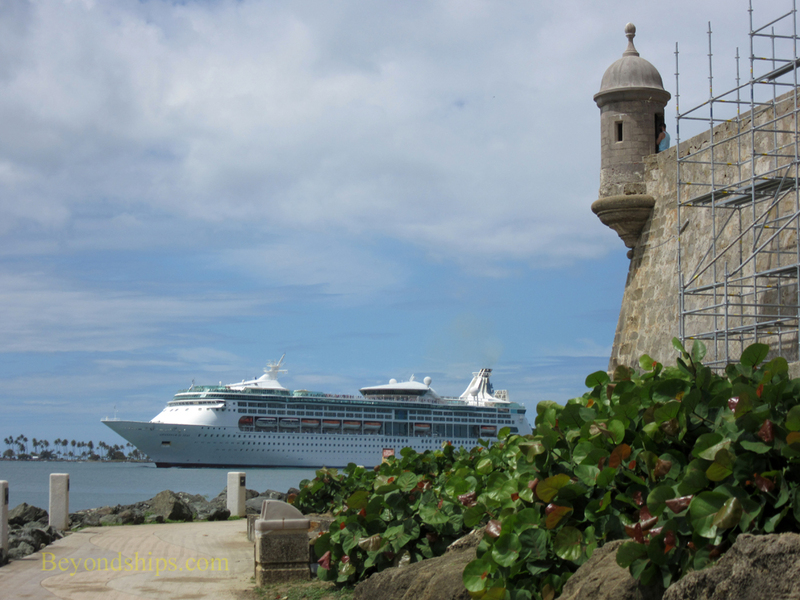 Large ships pass close by the paseo. 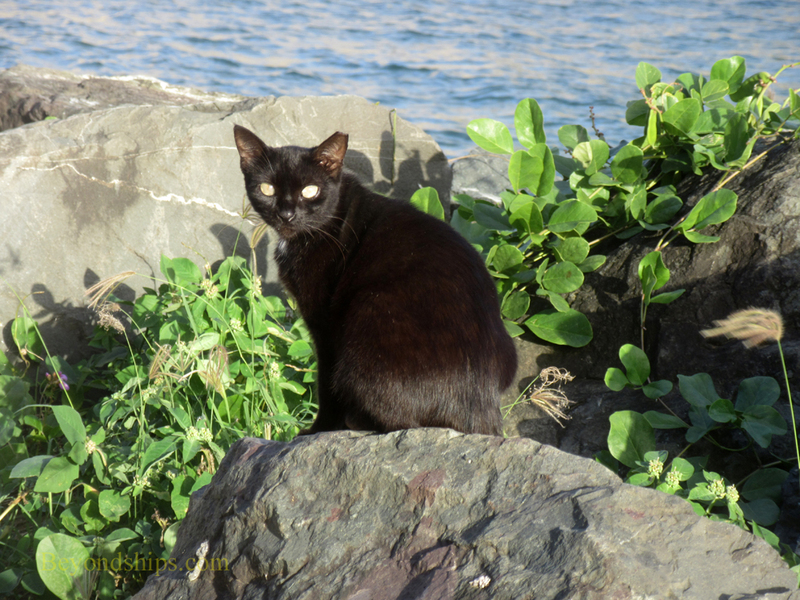 The paseo is the home of a sizable population of feral cats. This is so even though locals often walk their dogs along the paseo on weekends. 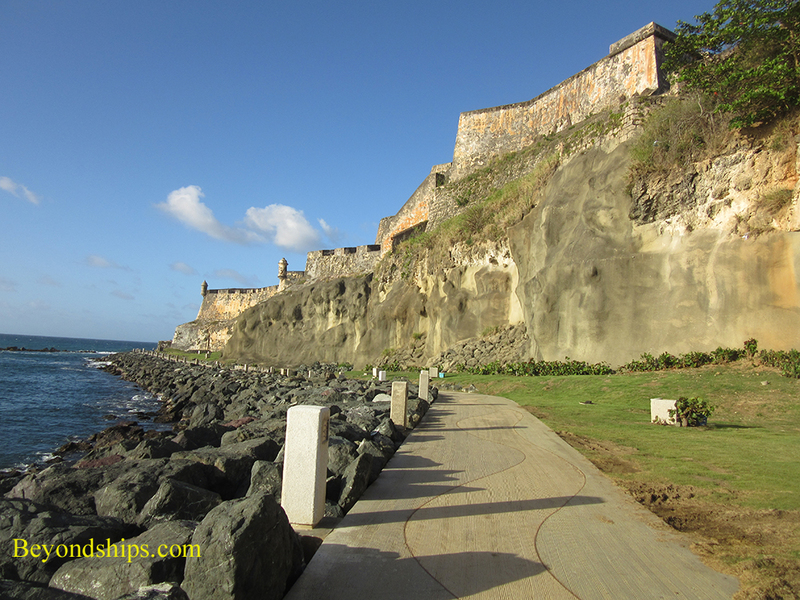 After the city walls end, you come to an area where there are sheer cliffs bordering the paseo. Erosion is a serious problem. Rain, wind and the action of the ocean threaten the cliffs and the shoreline. 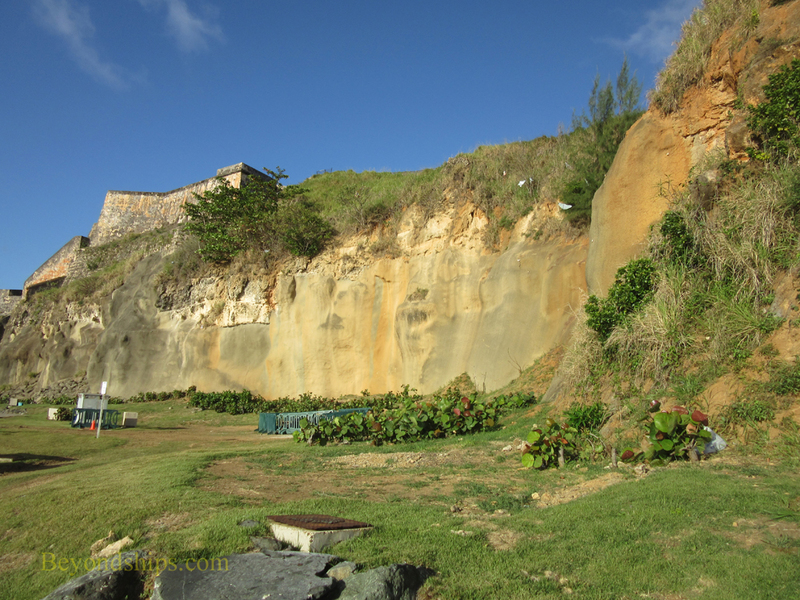 Therefore, the National Park Service has sprayed a coating of concrete (known as "shotcrete") onto the rock face to prevent it from crumbling. Along the same lines, inthe 1970s to 1990s, a rock pile (known as "riprap") was placed along the water's edge to preserve the shoreline. Another problem is plants. Seeds blown by the wind take root in the cracks of the city walls and cause the stone to crumble. These are removed by hand. 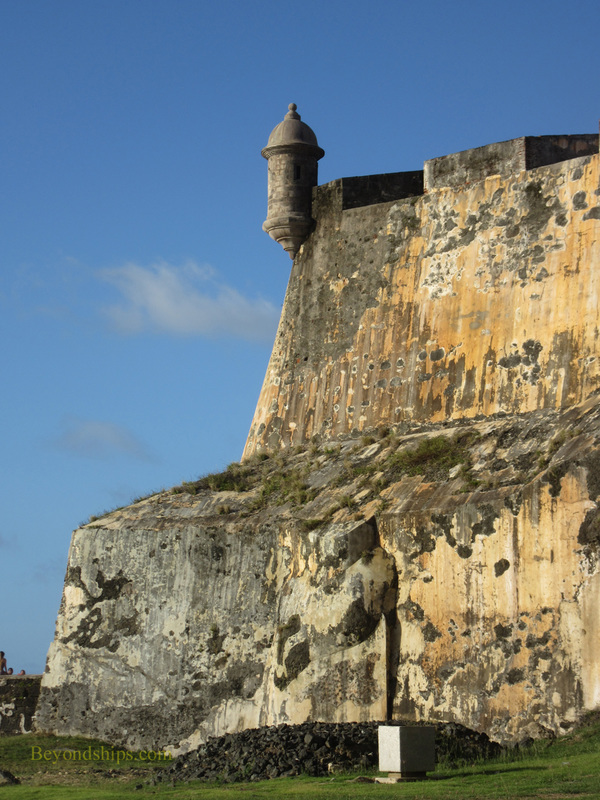 After the rock face, you come under the walls of the fortress El Morro. They rise some 140 feet above the sea and are at places 18 feet thick. 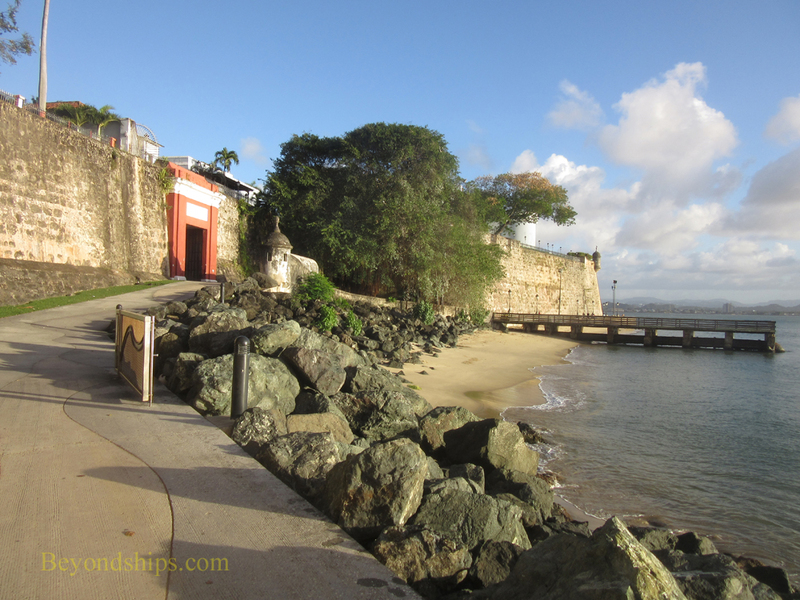 At the entrance to the harbor, the paseo curves around the headland. 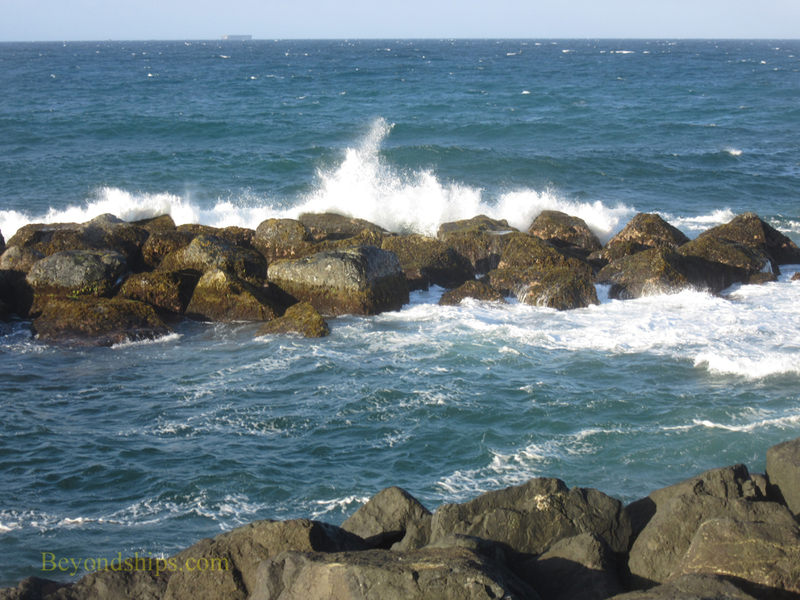 Here, the ocean waves crash against the breakwater rocks. The paseo ends here at a door leading into El Morro. This entrance is not presently open but it is hoped that it will be so in the future. Plans also call for the paseo to be extended up the coast to the Cemetery Santa Maria Magdalena de Pazzis.